Sewell’s achievement is driven by her lifelong commitment to God, family, and service. 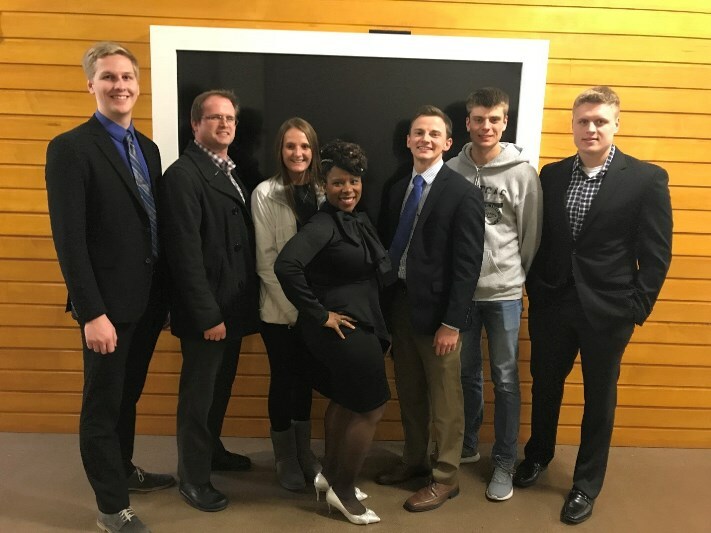 Professor Sewell (center) with 6 of her students at the 2018 lecture series featuring former secretaries of state General Colin Powell and Dr. Madeleine Albright. Destynie Sewell, J.D., MBA, and Assistant Professor of Business Law and Ethics was recently named the winner of the 2019 College of Public Affairs and Community Service (CPACS) Alumni Award for Excellence in Public Service. Sewell will receive the prestigious award at the March 5 CPACS Alumni Awards Celebration. The University of Nebraska at Omaha (UNO) alumna states that her dedication to giving back is motivated by all she’s ever known – God, family, and service. Growing up, Sewell’s mother would sometimes work 3 jobs to support the two of them. The women in her family were always committed to community and public service, and Sewell’s mother and grandmother worked in the community support field. Sewell was motivated by the lessons she learned in childhood to pursue her education at the UNO College of Business Administration (CBA). She earned her BS in Business Administration with concentrations in Banking, Finance, and Investment Science/Portfolio Management. She simultaneously received a BA from the College of Arts and Sciences, majoring in French. Sewell continued her education with the UNO CBA, earning an MBA in 2007. She received her Juris Doctor from Creighton University in 2011, gaining licenses to practice law in both Nebraska and Iowa and to appear before the United States Supreme Court. She worked with the U.S. Department of Veteran Affairs prior to starting her career with UNO. This attitude has driven Sewell to participate in various service organizations and service memberships. She is a member of the La Vista Civil Service Commission, serves as an ethics guest speaker for local organizations, co-directs her church’s youth mentoring program, and acts as a Sunday school teacher and Bible study leader for high school students. She is also a Faculty Advisor and individual mentor for several UNO organizations and programs, giving back to her alma mater. Sewell says that she is fortunate to have been a graduate of the UNO College of Business. She names the mentorship of Dean Pol, Assistant Dean Harland, Dr. David Volkman, Dr. Amy Rodie, Dr. Darryll Lewis, and Goodrich program professors Dr. Pamela Smith, Dr. Jerry Cederbloom, Dr. Michael Carroll, and Dr. Imefedia Okhamafe as instrumental to her success. Now, rounding out her third year of teaching at UNO, Sewell is committed to continuing the trend of inspiration and support she received from her mentors. With her commitment to paying it forward, Sewell has seen many success stories. One in particular stands out in which one of her students wrote her a note at the end of the semester. The student, a minority, thanked Sewell for providing minority representation at the college. Sewell has also exercised her commitment to providing opportunity to minorities in the Goodrich Pre-Law Society. In 2016, she played a major role in allowing the society to win the Nebraska Bar Association’s Diversity Award. Sewell says she is proud to encourage diversity in the field of law, which is starving for minorities and faces a particular lack of minority representation in Nebraska. As an extension of her commitment to creating student opportunity, Sewell also takes pride in expanding the legal studies program at UNO. The program has been steadily growing, largely from canvassing students and informing them that law can be an exciting, positive discipline. She aims to change the narrative that only political science majors can enter the field, and strategically features guest speakers and tours that are interesting to business students. Sewell has also partnered with other female professors within UNO CBA to create a CBA women in business and law mentoring group. The program will be focused on providing practical programming aimed at helping young women develop professional skills and better navigate the corporate environment. The group will provide assistance with networking, interviewing, resume writing, salary negotiation, and more. Everything Sewell does derives from her focus on providing encouragement, something she recommends to all teachers and mentors. She also wants everyone to realize that the necessity of giving back is never finished. “Service is never done. Learning is never done,” Sewell states. And now that she’s won the Public Service award, Sewell has no intention of slowing down. She is motivated to continue making strides in service, in providing opportunities, and in supporting students with a consistent attitude of thanks. Congratulations on your award and achievements and thank you for the inspiration you provide each day, Professor Sewell!